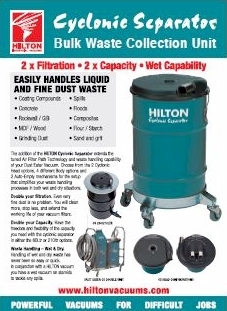 HILTON VACUUMS include the Hilton Dust Eater Vacuum Cleaner and other variations of this style of vacuum to suit a wide range of industries. Our diverse range of industrial vacuums to flue cleaning kits, covers all industry needs. 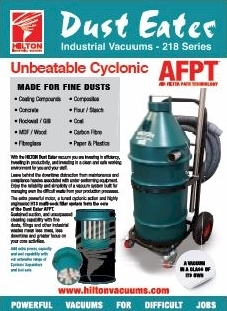 Check out the New and Improved Hilton Vacuums 218 Series. 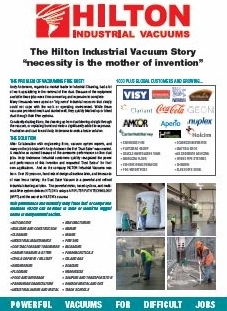 The HILTON VACUUMS team can assist with your specific industry requirements. We can assess where you are and direct you to where you want to be. Call or email us to arrange a meeting. We are dedicated to developing tools for safer, more productive, and more efficient work places. HILTON PRODUCTS accomplishes this mission, by drawing from over 25 years industry experience and a breadth of talent from various disciplines; Project Management, Industrial Maintenance, OH&S compliance and Mechanical Engineering. We design specialist vacuum cleaner systems and industrial maintenance solutions considering the ‘People, Process and Plant’ elements of industrial waste management. Hilton solutions are in over 20 different industries and currently in use by many industry leaders. Our unique design, takes the time, sweat and hassle out of your factory cleaning and workshop maintenance with our industrial vacuum cleaners and commercial vacuum cleaners for more effective waste management. Are these Industrial Vacuum Cleaners Right for Me? If you want to cut maintenance costs, better your product quality, and improve your workplace environment then you have come to the right place. Have you experience these vacuum cleaner problems? Other videos available on our YouTube channel.